I even passed by stretch goal by reading 17 chunksters this year. 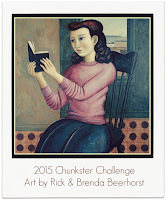 This is a challenge I often struggle with and I read almost three times as many chunksters this year as I normally do. Several were particularly slow going, ether for good reasons, like Nabokov's Collected Short Stories, or not, like Guard of Honor that may have won the Pulitzer Prize but hasn't stood the test of time. My chunkster jag this year is part of the reason I am going to fall short of reading a 100 books i 2015, and far short of my usual 110 or so. It looks like I'll come in right around 95. The CHUNKSTER CHALLENGE was started by Wendy at Caribousmom and is now hosted by Vasilly at 1330V. The sign-up page is here. The basic idea is to read books with 450 pages or more. E-books and audiobooks count, as do collections of short stories, essays, or poems. Pretty much the only thing that doesn't count is graphic novels. This is a self-motivating challenge. Now that audiobooks count, I am going to set a goal of 12 books, with a stretch goal of 15. We'll see what others pop up.